For Samsung, HTC, Sony, LG, Motorola, iPhone etc. 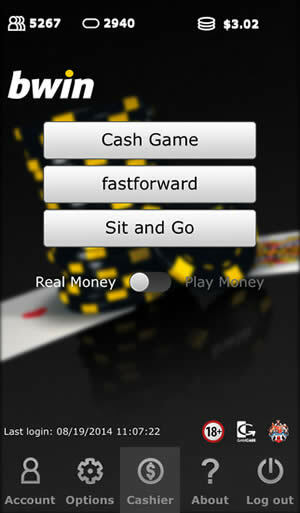 Play Texas Hold'em cash games on any Droid device. Compete in Sit & Go tournaments from your smartphone. High-speed fast fold poker games also available. Sign-up rewards include a $500 deposit bonus & freerolls. 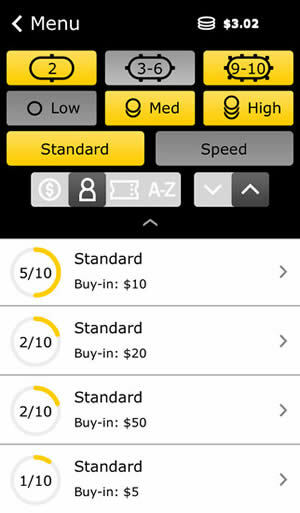 Bwin is no stranger to the world of online poker – and it’s no surprise that when more and more major companies started pumping out mobile poker clients, Bwin followed suit and released a shiny new Android app to accompany its iPhone offering. Unsurprisingly, the app grants you a unique chance to go head to head against both mobile clients and desktop-based players forming the PartyPoker network these days, which basically means that finding a game shouldn’t be a problem regardless of your time zone. In order to take advantage of Bwin’s Android poker app, you will have to download the software package first. Thankfully, the download process is fairly simple and as you’d expect the site will hold your hand until the app is safely installed on your mobile device. If you’re new to Bwin poker offerings, you’ll also have to go through the registration process, which is also easy and painless – but there’s a catch here. Regrettably, Bwin doesn’t accept new customers from a number of countries due to various legal reasons, so if you’re unlucky enough to fall into that category you’ll have to search for another app with similar functionality. Luckily, the number of places around the world that don’t take kindly to online poker is fairly limited, so odds are high you’re going to complete the download and registration process without any problems and you’ll be able to utilize the site’s excellent welcome bonus of up to $500 to your full advantage. The first thing you will likely notice once you launch the new app is simply how impressive the design is and how faithful to the desktop-based client it stays despite being forced to cope with the limited real estate of a mobile device in terms of screen size. The visual design is a familiar mix of black and gold and the options you’ll be faced with in the lobby are Play for Real, Play for Fun and Preview. If you’re new to mobile poker apps, I’d advise you to go ahead and Play for Fun before you move on to wagering real money – even if you feel confident in your poker skills. Basically, mobile apps differ from desktop-based software in terms of functionality and controls to some extent, so it’s pretty easy to make a potentially costly mistake of performing the wrong action at the wrong time. Thankfully, Bwin went to great lengths in terms of making such mistakes as unlikely as possible since the app is almost guaranteed to run smoothly on any Android machine. An online poker veteran is sure to recognize all the buttons available to him and also, they’re all big enough to make the act of playing the game a breeze. The only drawback is the fact that the menus aren’t really well suited to smaller mobile devices, as it’s pretty hard to click some of the buttons placed there. Fortunately, once you get your settings right you won’t feel the need to tinker with them anymore, so in the end it’s a rather minor drawback. Sticking with the Play for Fun option is guaranteed to provide you with some thrills and entertainment, but in the end you’re probably going to move to the Play for Real mode as, and let’s be honest here – poker is significantly less fun when there’s no money on the line. 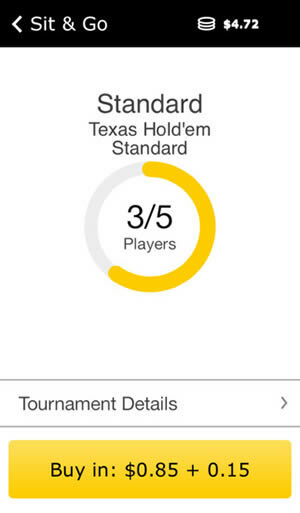 This mode can make or break a mobile poker app, but I’m glad to report that Bwin didn’t drop the ball on this one, as the game provides you with a number of options to choose from. While Texas Hold’em is currently the only poker variant available, the stakes range from $0.01/$0.02 all the way to $25/$50 and you can pick whether you want to play at a 2-max, 6-max, 9-max or a 10-max table. The only problem with this app lies in the fact that once you’re done with selecting your tables settings, the game will place you at a random table, which makes selecting your opponents a rather tedious process. However, keep in mind that most poker apps share this flaw – so in the end, it’s hard to blame Bwin for following the latest trends, which I'm sure are also dictated by some inherent limitations of mobile software development technology. Sit-and-Go tournaments and fast-fold turbo poker games are also now available on any Samsung Galaxy, Lenovo Vibe Z, HTC One M8 and device. Last but not least, the preview function allows you to view a sample hand played using the app, which should give you enough understanding to dive into free-play games even if you’re fairly new to poker. That being said, this sort of tutorial mode has a massive untapped potential, so it’s a bit of a shame that Bwin decided to go with such a limited implementation. I’ve already mentioned that the app lobby looks excellent, so I’m just going to say that the same holds true when it comes to table mode. Yes, the audio effects can get annoying at times – but as with all mobile poker clients, you can simply opt to mute them and enjoy the game without any sounds whenever it’s your time to take action. What really makes the Bwin Android app so unique though is how well it deals with bringing the almost full functionality of a desktop-based poker client to your mobile device. When you disregard the possibility of playing with additional tracking software, this app provides you with all the tools you could ever need complete with a four-color deck of cards, which makes it easy to distinguish the spades from clubs and the hearts from diamonds on such a small screen. Yes, the sliders that you use to determine the size of your bets may feel clunky early on, but it’s more than possible to get used to them and you might actually end up being thankful for such low responsiveness as they make over-betting by mistake almost impossible. Given how well this app performs in table mode, it’s actually rather unfortunate that there’s no multi-tabling functionality available – but in the end, it’s hard to expect something like that from an app that is supposed to run on any Android 2.2 device. In terms of competition, the app provides you with a rather standard Bwin experience, sans table selection. Most players aren’t particularly skilled and there’s a fair amount of fish to catch here, so if you’re an experienced player looking for a softer competition or you’re simply learning the game you’ve come to the right place. To conclude, Bwin’s Android poker app doesn’t really break any new ground in terms of mobile gaming, but it does a perfect job when it comes to giving you the ability to compete with thousands of Bwin players anywhere you go. 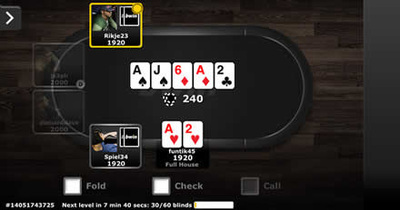 Originally the app only featured Texas Hold'em ring games, but the recent addition of fast-fold poker and Sit-N-Go tournaments has made it one of the best all-round pieces of mobile poker software on the market today.